Brodi Ashton: Why I let out a Blood-Curdling Scream Saturday Morning. Did you hear it? Why I let out a Blood-Curdling Scream Saturday Morning. Did you hear it? So, Saturday morning, I wake up. Sam comes in my room and is all, "We can't find Kid C's iTouch. Can you help me?" He looks at me, I look at him, as we do most mornings. I go downstairs and start looking while Sam looks upstairs. After a few minutes, he calls down to me. I stand at the bottom of the stairs, he is at the top, and he tells me he found the iTouch. All the while, he is looking at me. I come back upstairs, and go to the sink to brush my teeth. As I'm putting toothpaste on my toothbrush, Sam appears behind me. I turn around, and naturally, we look at each other. He says, "I'm off to work. See ya later." I'm all, "Okay! See ya soon!" He leaves and I turn back around to start brushing my teeth. I catch a glimpse of myself in the mirror. And I scream. On top of my head, nestled in my hair, is a giant brown spider. Hi Brodi! I love your hair. So, the spider and I calmly have a conversation about my split ends, and he insists I shouldn't have been able to see him because he was deeply entrenched in my dark roots. Just kidding. There was no conversation. Unless you count my screaming and running outside, yelling for Sam. Me: "Sam! There's a spider on my head!" 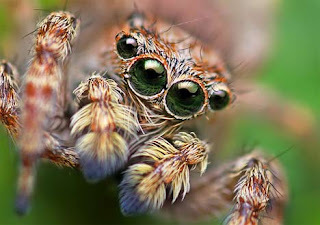 He takes one look, and I see it on his face that he has indeed seen the spider. me: "Get it out! Get it out!" Summoning up a buttload of courage, he digs his fingers under the spider, and flings it across the porch, along with only a few strands of my hair. First - no surprise - there was a spider in my hair. Not a small spider. A giant brown spider. This has resulted in more than one dream about spider eggs being laid on my scalp. For the rest of the day, about every five minutes, I would involuntarily scream and scrape my fingers through my hair. Second, Sam talked to me three times. Three times! Face to face. And he didn't see the spider. Sam was all, "Nice hair. So I have to go to work now. See ya." I'm trying to rein in my anger, but when you have a spider on your head all morning, all you can think about is that there has to be someone to blame. How about y'all? 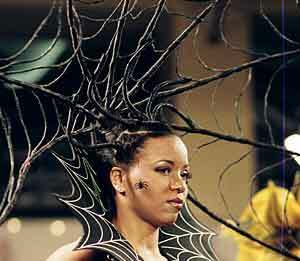 Anyone ever had a spider on their head? I can tell you this much: I'll never be the same again. OMG, this is horrifying!! LOL!! There was a kid near us a couple of summers ago that had a spider crawl in his ear and lay eggs. Try to sleep after you've heard THAT story. That's awful! I'll be cringing and shuddering all day now. Yuck! I did once have a bug fly into my mouth while waiting in line for the Matterhorn at Disneyland. It was rather nasty. Oh wow. I would have been screaming too. Nasty creature! That is definitely something that would cause nightmares. Kristin- Seriously, I have nightmares where I'm scratching at my scalp, and I pull my fingers away, and there are a million little eggs under my fingernails. As for Sam, it's really not his fault. He's a guy. 'Nuff said. And I've always said I'd be a terrible witness because of my inability to notice things. Um, I think I'd have noticed a spider. But I'm a girl. OK, you picked out this one instance. How about the time when I noticed the monkey that was on your shoulders? Or what about the time that I noticed that there was a dog in your backpack back in college and told you about that? So, yes, I didn't say anything about the spider...but no harm, no foul. And the spider didn't seem to bothering you...and you didn't seem to be bothered by it, so I just decided to let things be and not stir the pot. Now I know, for future reference, that I should tell you when I notice a spider anywhere on your body. You are being very demanding. Sam- You are not helping your case. I can't wait until you have a grizzly bear on your back. I'm not gonna say a word. This just freaks me out reading it. Sorry I didn't believe you on Twitter. Well, it's not that I didn't believe you; it just sounds so incredulous and evil and freaky and creepy and .... I would never be the same again too! I hope your nightmares stop soon. 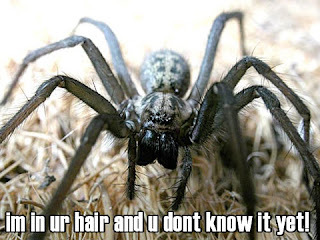 Otherwise go to a hypnotist and have him hypnotize you into thinking that there wasn't a spider on your head. Either a hypnotist or a Jedi, anyway. Jenni- I pick a Jedi. Now, where can I find one of those? Once there was a flying beetle under my shirt. I kept feeling this tickly thing and then I'd reach back and scratch thinking it was a hair or something and then my fingers touched something that was obviously not skin and I pulled it out and there was this ginormous flying beetle in my fingers and I screamed. SCREAMED!! So loud my husband came running from downstairs and I nearly dropped my second child (who I was feeding at the time) while the flying beetle continued to circle me as if it wanted back under my shirt. Sigh. I really hate bugs. Shari- Oh man, that is so freaking freaky! It's amazing how something so small can send us into hysterics. Ugh. Eeeee! Spiders hate me. Or, maybe, they love me. But I hate them. Once, my colleague across the hall notified me that there was a spider suspended over my head. It had crawled to a point on the ceiling DIRECTLY OVER MY HEAD and proceeded to lower itself down. If my friend hadn't saved me, I'd have had a spider in my hair. You probably don't want to hear about the time when a spider crawled over me while I was reading in bed. Or the time.... No, I'll stop. Robin- Yes, stop! Everyone stop! It's making everything worse! Deep breath. Okay. I'm okay now. totally sam's fault. the husband and i have our own charming spider story. after a hot and sweaty hour working in the garden, we hop in the car on our way to his parent's house. the husband, while driving, turns to me and asks if he has something on his face. seeing a large spider creeping from his eye down to his cheek, i do the most sane thing i can think of: i open the door and jump out of the moving car. epilogue: the husband no longer works in the garden. sorry about your creepy spider story. i would go and buy a bunch of those bug bombs if that were me. gross! Rachel- okay, that is too funny. I laughed for a long time. i saw "spider"...blah blah blah..."hair" blah blah blah" too much for me. spiders and mice make me scream! i dont have a good spider story--but i have a REALLY good mouse story. it involves me and a toilet and being 6 months pregnant. I can't even look at the pictures. Sick! Cath- it definitely wasn't pretty. Sami sounds like my kind of gal! Happy EVERNEATH Cover Reveal Day!